Kidney cancer starts in the cells of the kidney. The kidneys are located on either side of the spine and are responsible for filtering water and waste from the blood to make urine. 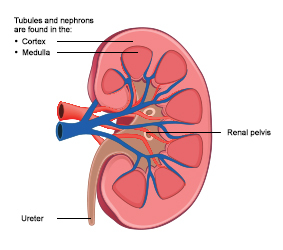 Renal cell carcinoma is the most common type of kidney cancer, which happens in cells that line the tubules. Renal sarcoma and primary renal lymphoma are rarer. To learn more about kidney cancer, visit the Canadian Cancer Society. You will also find links to other organizations that provide information related to kidney cancer. If you have been prescribed medication to lower your blood pressure, it’s important to take it regularly according to the instructions from your doctor or nurse practitioner. Reduce your exposure to cancer-causing chemicals while at work by following health and safety guidelines. Being exposed to trichloroethylene (used as a metal degreaser) is a risk for kidney cancer. Other substances that may increase your risk are cadmium and cadmium compounds (used in batteries). For more information on workplace exposures and kidney cancer, visit the Occupational Cancer Research Centre’s page on kidney cancer. For more information about diagnostic tests, you can visit the Canadian Cancer Society. To learn more about types of kidney cancer treatment, visit the Canadian Cancer Society. In 2013, there were 2,241 cases of kidney cancer diagnosed in Ontario, making it the 11th most common cancer. There were also 628 deaths from kidney cancer, making it the 14th leading cause of cancer death. Since the early 1980s, the rate of new cases of kidney cancer has increased in both men and women; however, the increase has been greater for men. People diagnosed with kidney cancer are 74.3% as likely to survive for 5 years after diagnosis compared to similar people in the general population. Learn about your risk of getting kidney cancer – Visit My CancerIQ and get a personalized risk assessment and action plan.